going up sharply, it will be because our economy remains sucky for years to come. That really would be a grim problem. Still, there are problems and there are problems. 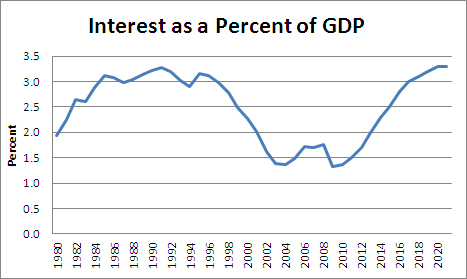 As Dean Baker points out today, the thing that debt worriers should really worry about is the interest on the national debt. After all, that’s the part that hits the federal budget. And guess what? It’s not really all that scary looking. CBO estimates that even with all the Bush tax cuts, even with the crappy economy, and even with all the money we’ve spent to deal with the crappy economy, interest on the debt will start to flatten out in 2020 at about the same level it was at after Reagan ballooned the national debt in the 80s. That didn’t seem to hurt us much either then or later during the Clinton boom of the 90s. Am I pulling a fast one here by switching from debt to interest payments? Not at all. Suppose we issue $4 trillion in 30-year bonds in 2012 at 2.75 percent interest (roughly the going yield). Suppose the economy recovers, as CBO predicts, and the interest rate is up around 6.0 percent in 4-5 years. The federal government would be able to buy back the $4 trillion in bonds it had issued for roughly $2 trillion, immediately eliminating $2 trillion of its debt. This will make those who fixate on the debt hysterically happy, but will not affect the government’s finances in the least. It will still face the same interest obligation. Look: you should be worried about rising debt levels. Even if debt isn’t strangling us right now, a higher debt level gives us less room to maneuver in the future. We should all be in favor of a plan that acknowledges the need for spending now but also takes seriously the need for both higher taxes and lower spending in the future. But should we be panicked about this? Not really. If you have any friends who are, show them the chart above. It’s not the end of the world.